This is approval for growing the potatoes, it’s not a food safety approval. That falls under the FDA, who hasn’t weighed in yet, but is expected to shortly. 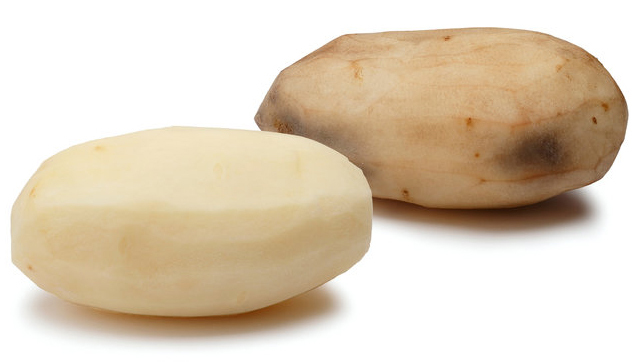 J.R. Simplot Co.; Determination of Nonregulated Status of Potato Genetically Engineered for Low Acrylamide Potential and Reduced Black Spot Bruise, US Federal Register, effective 10 November 2014. Summary: We are advising the public of our determination that potatoes designated as Innate TM potatoes (events E12, E24, F10, F37, J3, J55, J78, G11, H37, and H50), which have been genetically engineered for low acrylamide potential (acrylamide is a human neurotoxicant and potential carcinogen that may form in potatoes and other starchy foods under certain cooking conditions) and reduced black spot bruise, are no longer considered a regulated article under our regulations governing the introduction of certain genetically engineered organisms. Our determination is based on our evaluation of data submitted by J.R. Simplot Company in its petition for a determination of nonregulated status, our analysis of available scientific data, and comments received from the public in response to our previous notices announcing the availability of the petition for nonregulated status and its associated environmental assessment and plant pest risk assessment. This notice also announces the availability of our written determination and finding of no significant impact. Determination: APHIS has determined that Simplot’s Innate TM potatoes are unlikely to pose a plant pest risk and therefore are no longer subject to our regulations governing the introduction of certain GE organisms. So, the USDA says they’re safe for the environment, rather, they won’t pose a threat to other plants. What about insects and other wildlife? I noted they based their determination upon data submitted by Simplot, not an independent lab. FDA believes that the new techniques are extensions at the molecular level of traditional methods and will be used to achieve the same goals as pursued with traditional plant breeding. The agency is not aware of any information showing that foods derived by these new methods differ from other foods in any meaningful or uniform way, or that, as a class, foods developed by the new techniques present any different or greater safety concern than foods developed by traditional plant breeding. For this reason, the agency does not believe that the method of development of a new plant variety (including the use of new techniques including recombinant DNA techniques) is normally material information within the meaning of 21 U.S.C. 321(n) and would not usually be required to be disclosed in labeling for the food. The FDA does not do its own safety studies. It relies on the results of studies done by companies that seek to make a profit selling the particular GE product. How confidence-building. This entry was posted in GMOs on November 8, 2014 by Bix. I just wanted to point out the reason for these GMO potatoes: Baked potatoes, and other common complex carbohydrates/starches including wheat and other bread products, are high in acrylamide, a known carcinogen. Potato manufacturers have moved decisively to reduce the amount of this compound in their product, but I haven’t seen the same emphasis among wheat producers. For that matter, I rarely see antinutrients and toxins like acrylamide mentioned among proponents of starch-based diets. How do you avoid dangerous levels of these compounds? Acrylamide is metabolized by our cells into a non-toxic molecule. It can either go through the cytochrome P450 system (which metabolizes most drugs) or it can attach to the powerful endogenous (produced by our cells) antioxidant glutathione.